A great industrial looking piece. 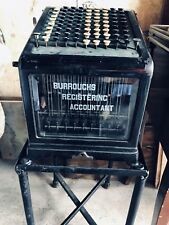 Vintage Burroughs Cashier Register Machine Condition Good as it, Still Workable. Works great up to 7 digit numbers, adding and subtracting. Original stylus and vinyl cover included. Made in "West Germany" is stamped underneath. Even still has the wood turn knob on it. The gold colored fancy knob on the front of the cash drawer is still in place. Lots of finish loss from use/wear. Would make a great gift for a special occasion or keep for yourself! We do our best to present accurate, detailed information about every item listed.However, we are not product experts in every asset category we may list; therefore. This item can be picked up at our warehouse in Ventura. VINTAGE NATIONAL CASH REGISTER COMPANY MONEY BAG NCR DAYTON OHIO. It is missing the top button as pictured. Look at pictures to view condition. Payment is due within 3 days and only ship to US. Previously owned and use Arnold ink check writer. Item shows wearing use still appears to be functional please see our pictures as they are part of our description. All reasonable offers will be considered but not guaranteed. Thank you for the opportunity to serve you. We 4 original keys that go with this cabinet. Rare unique antique to add to your collection. We do our best when restoring or upcycling and we make mistakes. We are not professionals; we just love what we do. VINTAGE 1920'S FELT & TARRANT COMPTOMETER ADDING MACHINE WORKING CONDITION. All keys intact and in perfect working order. This is a model J Shipped with USPS Priority Mail. RARE VINTAGE BURROUGHS CHECK WRITING MACHINE MODEL T8409. Good Condition!!! It is style/model # T-8409. Serial #R2819. It was used at Planters Bank and Trust( it still has the bank foil sticker on it). It is in Really Good Condition but does have a small crack on the plastic case (see pictures for more detail). Repurpose-chances are it won't be used in its original form, the possibilities of use are only limited by your imagination. reuse-too much from our lives is throwaway. This is a fabulous ornate Art Deco, cast iron office machine. R.C. ALLEN. CONDITION: IN THE SIXTH ROW, THE NUMBER SIX IS STUCK IN THE DOWN POSITION. THE ARM MOVES FREELY AND IT PRINTS THE NUMBERS. THERE IS VERY, VERY LITTLE INK LEFT (ALMOST NONE). NOT SURE OF THE WORKING CONDITION. In nice shape with brown holder, 14"x4". See pics for exact details. Residue stuck on the bottom (see picture). It is stamped "Made in West Germany.". Golden Gem' chain adding machines by Automatic Adding Machine Co. I am not an expert and have described this item to the best of my ability. 'The Protectograph'. circa late 1920s era piece, last patent 1928. Rochester New York. Antique Check Writer. wear and tear throughout with age and use. shows wear and tear with age and use. On-board stylus integral to the machine whereby it slides into a bottom hole and can be removed to operate the wheels. Reset lever resets the display to zeros with a couple of pushes. Proper working order. THIS IS A MODEL 37 57 50. SEEMS TO WORK FINE BUT THE INK RIBBON NEEDS REPLACED. Antique Circa 1912 American Adding Machine Model 5, American Can Co Chicago ILL. IN GOOD WORKING ORDER. AUGUST 27, 1912 (/) OTHER PATS. It is also marked there: CHICAGO, ILL.
BURROUGHS protectograph checkwriter. 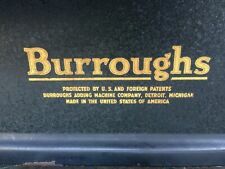 This is a BURROUGHS protectograph checkwriter No. From the Main Branch of a Major Bank. The unit works/ embosses. See Pictures. Sold AS IS. See Photos. Wonderful early 1900's era piece. We do not know how to use the device. All rollers knobs, and handles work freely and easily. Original old black paint with gold pin stripping. Quite heavy. 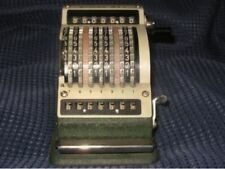 1920's calculator in excellent condition. Extra role of tape included. In working condition. See pictures for complete condition details. 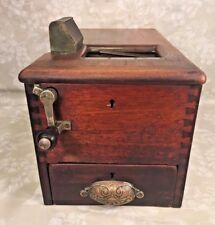 Up for sale is a Wales Adding Machine. See pictures for details regarding quality, condition, and item specifics. Five windows at the bottom show sums of numbers entered. The device lacks a stylus. It apparently was his only invention. Groesbeck's Calculating Machine. Patented Mar. 18. 1870 (by John Groesbeck). I believe it's from the 1920's based on brief research. The serial number is 5-1149549. The ruler portion near the 0 mark is bent slightly. The stylus is present. The clearing function works well. All wheels turn well, though the leftmost wheel is a little harder to turn than the rest of them. Vintage National Cash Register (Large) Poster-Rikes Store Window Dayton,Oh.